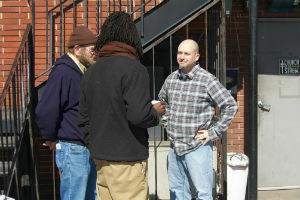 Photo: Andy Odle (right) sharing community with the most vulnerable in Atlanta, Georgia. In 2013, the Global Gathering of the Church of God held its Global Forum on the subject of reconciliation. In 2014, Church of God Convention attendees were introduced to a form in which reconciliation could be lived out—in awareness and action concerning human trafficking. This May, the Church of God has an opportunity to dig deeper into what it means to be reconciled to God and neighbor. Church of the Street in Atlanta, Georgia, will host the Reconciliation and Justice Academy, May 11–15. Not just another conference, this experience is designed to be a weeklong intensive for those who really want to join with the most vulnerable among us to collectively develop the heart and habits of our Lord Jesus Christ. The Academy will offer specialized tracks in the areas of human trafficking, intentional neighboring, community development, asset-based ministry, and the building of reconciling churches. Speakers and trainers will include Andy Odle,(Church on the Street), James Lewis (Anderson University School of Theology), Kimberly Majeski (Stripped Love and AU School of Theology), Chris Heuertz (Gravity), Shawn Duncan (Eiro), as well as Jim Wehner and Katie Delp (FCS Urban Ministries). Church on the Street is a ministry that intentionally creates and sustains ministry—not to the most vulnerable in society, but with the most vulnerable in society. Founded in 1999, the organization with deep Church of God roots uniquely ministers among the most vulnerable, in an urban setting. Some of the most vulnerable are those who have become victims of human trafficking. On the streets, human trafficking is one of many areas where reconciliation with God and neighbor is greatly needed. As such, Church on the Street has served as a part of CHOG TraffickLight from its inception in 2014. As an extension of Church on the Street’s Center for Practical Theology, the Academy will give attendees practical, tangible opportunities for theological reflection that lead to action. This is just one facet of the event that sets it apart from others. Take your faith to the streets, and be amazed how it will stretch and grow. Plan to attend the Reconciliation and Justice Academy, May 11–15 in Atlanta, Georgia. For more information, including how to register, visit http://www.churchonthestreet.com/#/practical-theology/the-academy. Learn more about the Church of God fight against human trafficking at www.CHOGTraffickLight.org. This entry was posted in All Church of God, CHOG TraffickLight, Southeast and tagged activism, Andy Odle, Atlanta, cause, Church on the Street, community, Georgia, James Lewis, justice, Kimberly Majeski, practical theology, Reconciliation, social, urban. Bookmark the permalink.